The Fed is now focused on recent improvements in the labor markets as it prepares for the 2015 rate hike. 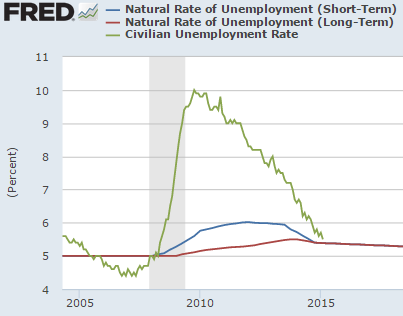 The unemployment rate is approaching the so-called "natural rate of unemployment". This is the equilibrium state beyond which we should, at least in theory, start seeing wage pressures. However here are two indicators suggesting that with the disinflationary pressures in the background, the summer of 2015 liftoff may be premature. 1. The US. Bureau of Labor Statistics publishes an index that tracks individuals who are "not in labor force, searched for work and available". It's a good indicator of labor force slack in the US (as opposed to labor force participation rate which is impacted by demographic factors). This may indicate that wage pressures nationally, particularly for unskilled labor, may be some time off. 2. Moreover, instead of seeing signs of wage pressures across the country, wage growth is actually slowing quite sharply, especially for non-supervisory employees. The Fed may be able to justify a 2015 rate hike by stronger payroll numbers and lower unemployment rate. It can also focus on froth in the financial markets. But for now raising rates due to "wage pressures" will be difficult to justify.